Sunday, September 28th from 4:30PM to Sunset at Beard’s Plaisance between 44th and Upton Ave. S.
SENIORS to arrive early (4:00) to help with set up. JUNIORS are asked to stay a bit longer and help with clean up duties. If you have ski equipment, clothing, or protective gear to sell, this is the time. And if you need equipment, this might just be your opportunity to find what you need at a reasonable price. 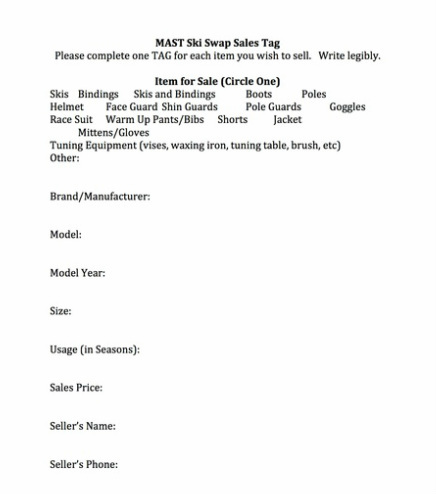 Attached is an Ski Swap Sales Tag that you can print, complete, and attach to any equipment you want to sell. The Annual Meeting of the Minneapolis Alpine Ski Team will be held at 5:30PM. Board members and coaches will offer short presentations covering team finances, training and camp plans, fundraising, and parent volunteer needs. The MAST website (mailto:http://www.mplsalpineski.org/) will be updated by the end of the weekend with valuable information about upcoming equipment sales and ski swaps this fall. 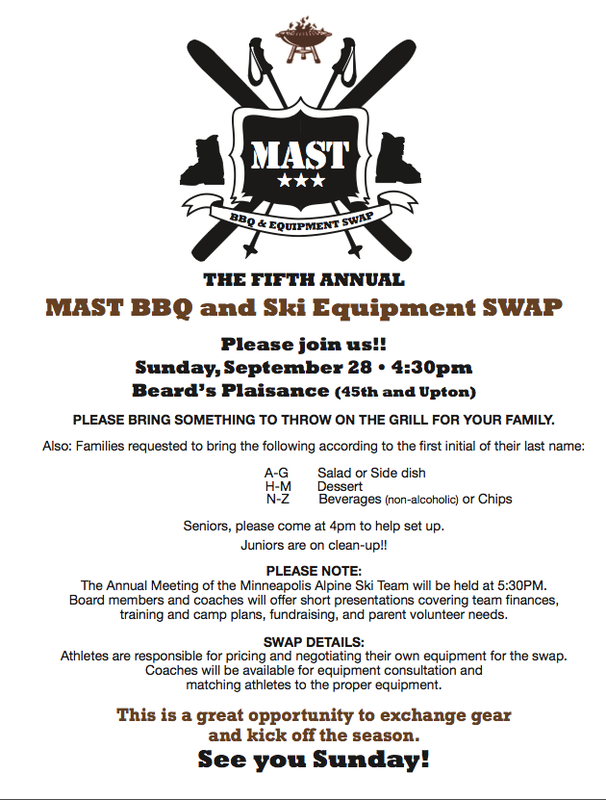 If you don’t find what you need at the MAST picnic, you will want to check out one or two of the ski swaps to save some money. This is a great opportunity to connect and reconnect with teammates, parents, and coaches, swap gear, and learn about our plans for the coming season. And if you are new to the team, please don’t be shy about attending. We want to meet you and help you get integrated into our program.